The Sri Lankan government has stepped in to try to stem a severe shortage of a national staple - coconuts. The felling of palm trees has been banned without the special permission of the Coconut Cultivation Board. The government has also begun importing coconuts from India and Malaysia, and attempted to impose price controls. The coconut development minister said the shortage was a "burning issue". The hard-shelled fruit is an intrinsic part of Sri Lankan culture and cuisine. Coconuts have also traditionally been exported as well. Shoppers at a food market in a suburb of Sri Lanka's capital, Colombo, told the BBC they were not happy about the situation. Periapperummal Dalton said the price of a coconut had doubled in two months to as much as 60 rupees ($0.54). Analysts say the shortage has arisen because coconut plantations have been unscrupulously converted for housing development. Production has also been affected by the relatively high cost of fertiliser. 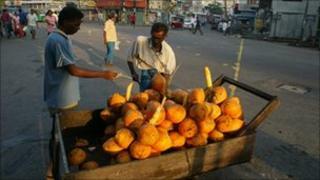 The government last week tried to cap the price of coconuts at 30 rupees and rationed their sale in official outlets. But supplies ran out and the coconuts appeared at higher prices on the black market. Two vendors at the Colombo coconut market said that with imports about to enter the Indian Ocean island, prices were already beginning to fall. President Mahinda Rajapaksa's 2010 election manifesto this year declared that Sri Lanka was importing far too much food. His government is currently engaged in a campaign to boost domestic food production. But now coconuts, along with poultry, are being imported as seasonal demand rises. Coconut milk lends a distinctive flavour to Sri Lankan curries of fish, meat and vegetables. Coconuts are also used to make chutneys, pickles known as sambols and cooking oil.